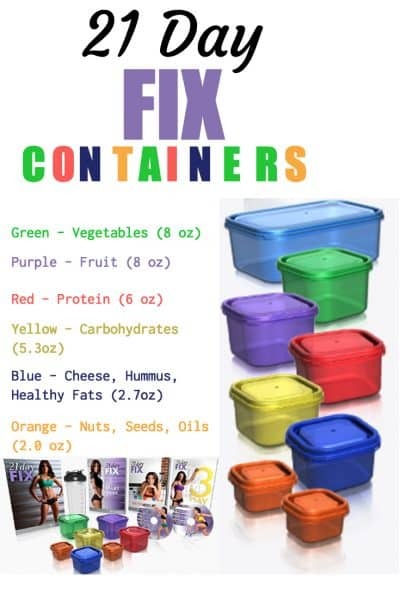 21 Day Fix Containers To Organize Your Food! The 21 day fix portion control containers are a great way to organize your meals throughout the day to the exact portion of food you need to eat. Take the guess workout and make it easy on yourself. In a Hurry? See the discounted price on amazon here. Join hundreds of people that love using them! into a healthy, happy, fat burning machine? You’ve probably heard someone say this before and maybe you feel a little jaded after failing to get the results you wanted. Don’t worry, you’re not alone. In fact, I was in your exact same shoes before I added 21 Day Fix Containers into my regiment. By the way they also can work for other workouts. You a show down here at PiYo Vs 21 Day Fix. Because I’ve seen them work first hand on myself and my friends, I want to share HOW they work with everyone. First, you must believe that you deserve your dream body. If you don’t you will be more likely to give up – don’t fail before you even start! By focusing on portion control, rather than counting daily calories, you know that what you’re eating is always the right amount based on your diet goals. 21 Day Fix Portion Control Sizes, colors, oh my! The purpose of breaking the containers into different sizes and colors is to make your meal planning as simple as possible. Your day can be hectic and to ask you to calculate every calorie is not only time consuming – it can be such a headache that many people quit before they even start. 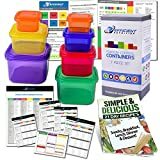 You might feel a little intimidated when you first see these food portion control containers: all of the colors and sizes, what does it all even mean? All you have to do is calculate your target calories one time and then the sizes tell you how much to eat and the colors tell you what kinds of food to eat. See, that’s why these 21 day fix containers are so amazing – they take away any guesswork! Here, let me break down exactly what the different colored containers mean below. Blue Container (2.7oz): Healthy Fats & Cheeses. 2 Orange Containers (2oz): Seeds & Dressings. As you can see, your main focus is getting nutritious fruits and vegetables, along with high-quality proteins and carbohydrates . Instead of cutting out things like fats, you simply portion them accordingly. We all know that a super strict diet is not only miserable to undertake but also causes a lot of people to cheat. Remember, the key is portion control! Click here to see the best price on amazon to get your own set. Okay, great – but how do I know how much to eat? While you don’t need to calculate calories each day, you will need to do it once to get started. It’s not hard – I’ll help you do it right now! 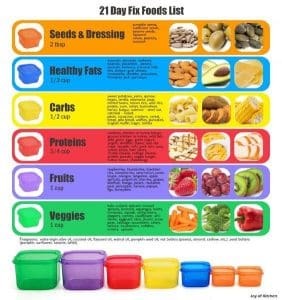 Now that you know your calorie range, here is how many of each color 21 day fix container that you will need to meet your calorie requirements. The worst part of losing weight is that creeping hunger pang that settles in after eating half an apple for lunch. Well, with the 21 day diet containers, not only are you getting an easy way to portion out your food, the portions are incredibly filling. Just fill your container all the way up and chow down throughout the day. You will go through multiple containers per day. No need for the “empty stomach anxiety” that comes with most diet plans. Who wants to lug around a bunch of clunky food containers everywhere you go? That’s the beauty of the 21 day fix food containers are the sizes. Not are they lightweight and compact, but they’re also practical for everyday use. By adding them into your daily routine, you will start your journey into a healthier, happier version of yourself. Enjoy them as a quick snack at your desk or right after the gym – it’s up to you. Wouldn’t you feel better knowing that you didn’t have to stress about what you needed to eat or how many calories to count or if you will have enough food for the day? How many times have you walked into a grocery story intent on buying healthy things, only to leave with sodas, ice cream, cookies, and other junk food snacks? Maybe you went in there hungry or maybe you just couldn’t resist those delicious treats. There is a way to overcome this and keep yourself on track: planning and by following the 21 day fix schedule. Once you know how much food you need to eat throughout the day and have your 21 fix containers, you are ready to start losing weight and improving your health. To really make this happen, you need to plan your grocery shopping BEFORE you walk into the store. Otherwise, you’ll be tempted to buy things that you know you shouldn’t. The number of times you shop per week is up to you, but try to make sure that you go enough times to keep fresh fruits and veggies stocked in your fridge. Imagine that you wake up and look in the mirror at a slimmer, healthier you. All of your hard work has paid off and you feel like a million bucks. It wasn’t even that hard! All it took was a little discipline, doing the 21 day fix dvd, following the meal plan using the 21 day fix containers, and the weight basically fell off on its own. You don’t have to keep dreaming about that great body. You can have it by purchasing the 21 day fix portion control containers and start your path towards a great body and excellent health. Stop making excuses and procrastinating. This method is so simple that there is no reason for you to not stick with it. You don’t have to count calories every day – that alone is awesome. These meal portion containers are so convenient, try them and see for yourself! Take control of your health and start portioning your way to success. Click here to purchase a set and start your path to your dream body. What are you waiting for? Let’s get you started loosing weight today.